The cruise ship Viking Sky reaches the port of Molde under its own steam on Sunday. A luxury cruise ship has safely arrived at port in Norway after a harrowing ordeal that started when the ship's engines failed during a storm off the country's western coast on Saturday. 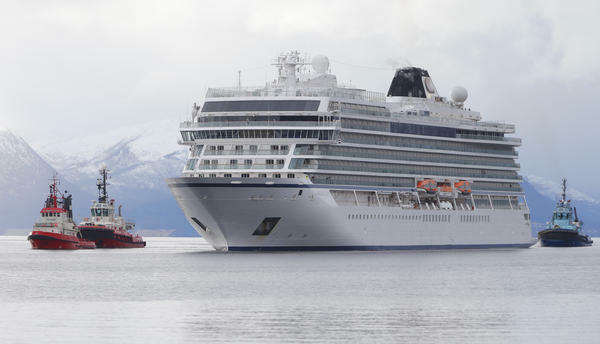 The Viking Sky, operated by Viking Ocean Cruises, sent out a mayday signal after experiencing engine problems in the Norwegian Sea, according to Reuters. At the time, the ship was carrying nearly 1,400 passengers and crew, many of whom were senior citizens. The engine trouble occurred in a stretch of waters known for rough, frigid waters called Hustadvika, which as Reuters reported, is known "shallow waters dotted with reefs." To make matters worse, the engine struggle came during a storm with strong winds gusting at a speed of roughly 79 feet per second, according to the Norwegian Meteorological Institute. "It was very nearly a disaster. The ship drifted to within 100 meters of running aground before they were able to restart one of the engines," Hans Vik, who heads the Joint Rescue Coordination Centre for southern Norway, told TV2. Dramatic rescues were underway on Saturday as passengers on the ship were airlifted on a wire one-by-one onto helicopters that hovered above while the ship tossed in the waves. Rescue services evacuated a total of 479 people, Reuters reported, and by the time the ship arrived in the port of Molde on Norway's west coast, about 900 people were still on board. Officials for Viking Ocean Cruises told the Associated Press that 20 people suffered injuries. Passengers on the ship described a scene of chaos as they waited to reach safety. In a message to the Associated Press, passenger Alexus Sheppard wrote, "It was frightening at first. And when the general alarm sounded it became VERY real." Sheppard shared video on social media that showed the ship's floor rolling back and forth on an unsteady plane, followed by the crashing of furniture that clattered across the floor and sometimes slammed into passengers. Panels fell from the ceilings on top of passengers who were trying desperately to avoid harm. "The last 24 hours have been very, very scary, very frightening," an American passenger, Rodney Horgen, told Norwegian public broadcaster NRK. "The best word I suppose is surreal." He described his reaction to the Associated Press after a huge wave crashed through glass doors and swept his wife, Judie Lemieux, 30 feet across the floor. "When the windows and door flew open and the 2 meters of water swept people and tables 20 to 30 feet, that was the breaker. I said to myself, 'This is it.' I grabbed my wife but I couldn't hold on. And she was thrown across the room. And then she got thrown back again by the wave coming back." Other videos showed passengers strapped into orange safety vests as water rose beneath their feet. The wait to get back safely on land stretched for hours. The 915 passengers were mainly from the United States and Britain, Reuters reported, though there were also Canadians and Australians on board, among others. The bad weather subsided on Sunday, allowing the ship to reach safety. Norway news agency NTB reported Sunday afternoon the Viking Sky was traveling under its own power at a speed of 7 knots and not being towed. There were cheers in the port when the Viking Sky arrived, honking its horn triumphantly. Viking Cruises chairman Torstein Hagen praised the rescue operation by Norwegian authorities and the actions of the vessel's crew. He told Norway's VG newspaper that the events surrounding the Viking Sky were "some of the worst I have been involved in, but now it looks like it's going well in the end and that we've been lucky." Hagen also said that the company will make sure all the passengers get home safely and will be rebooking flights for them. Incidents like this are fairly rare. A 2017 report from the New Zealand government found that globally, roughly two cruise ships a year run aground and that between 1980 and 2012, about 16 cruise ships sank.